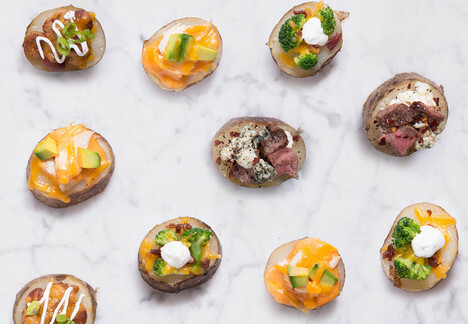 Bite-size potato skins loaded with the best toppings! Rinse potatoes and rub with oil and salt. Bake for 40 minutes or until soft when pierced with fork. Let cool for 5 minutes. Slice into ½-inch rounds and place on a baking sheet. Scoop out a small pocket from each potato, leaving a sturdy shell. Choose one of the fillings below. Steam broccoli according to package instructions. Chop into small pieces and place in a bowl. Add bacon, cheese, salt and pepper and combine thoroughly. Divide evenly among potato pieces and bake for 15 minutes or until cheese is melted. In a medium bowl, combine chili and cheese. In a medium bowl, combine steak, cream cheese, 3 ounces blue cheese crumbles, crushed red pepper, black pepper and salt. Divide evenly among potato pieces. Sprinkle with remaining blue cheese. Bake for 10 minutes or until cheese has melted. Divide evenly among potato pieces. Bake for 15 minutes or until cheese is melted.